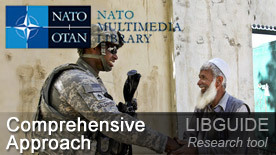 This LibGuide is intended to provide a few starting points to assist you with your research on issues related to the comprehensive approach; in particular, in the NATO context. What is the comprehensive approach? Literature on this topic seems to suggest that there does not appear to be a common definition. The paper, "The Comprehensive Approach to Civil-Military Crisis Management : A Critical Analysis and Perspective" (2010) by Dr. Cécile Wendling provides an analysis of how this concept is perceived by different international organizations such as NATO, the EU, OSCE, etc. The comprehensive approach appears to be a global concept that is often associated with civil-military cooperation; however, it goes beyond the existing NATO doctrine on enhanced civil-military cooperation (CIMIC). Furthermore, it is often mentioned in conjunction with counterinsurgency, Provincial Reconstruction Teams (PRT-Afghanistan), peace operations, stability operations and crisis management. "NATO’s new Strategic Concept, adopted at the Lisbon Summit in November 2010, underlines that lessons learned from NATO operations show that effective crisis management calls for a comprehensive approach involving political, civilian and military instruments. Military means, although essential, are not enough on their own to meet the many complex challenges to Euro-Atlantic and international security. Allied leaders agreed at Lisbon to enhance NATO’s contribution to a comprehensive approach to crisis management as part of the international community’s effort and to improve NATO’s ability to contribute to stabilzation and reconstruction." a. Improve the coherent application of the Alliance’s own crisis management instruments, including its military and political planning procedures. b. Improve the Alliance’s practical cooperation at all levels with partners, the UN and other relevant international organizations, governmental and non - governmental organizations (NGOs), contractors, commercial partners and local actors when planning and conducting operations. c. Enhance the Alliance’s ability to support stabilization and reconstruction (S&R) efforts in all phases of a conflict in concert with other actors. "NATO’s Contribution to a Comprehensive Approach" in AJP-01(D) ALLIED JOINT DOCTRINE, Chapter 2, Section III, December 2010, pages 2-11 and its more recent version AJP-01(D) ALLIED JOINT DOCTRINE, Chapter 2, Section I, February 2017, pages 2-4.